This painting describes an experience that happens without words and without explanations that could adequately do it justice. The symbols I used try to describe it to the best of my abilities in images so I will explain those. 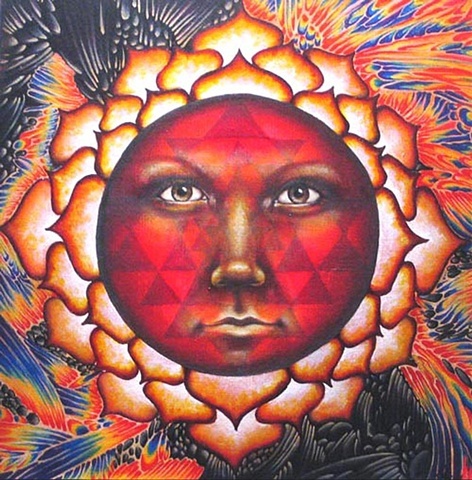 Behind the face is the Sri Yantra, the "shape" that represents the universal unity of masculine and feminine as well as the entirety of the cosmos as a womb or vessel for creation. The Sri Yantra is behind the eyes, somehow inside the face, inside the mind in a way and then encircled within the lotus, which is a symbol for rebirth, rejuvenation, and purity of consciousness. The fluid shapes around the lotus are in the colors of the chakras as well as black and white which represent the different levels of energies that are both within our bodies as well as around us and the duality of dark and light that pervades existence to create a whole.